While Ali and her dad were off skiing Whistler, my friend Patrick and I packed up and headed North as well. We were aiming for Rossland, BC a town just across the Canadian border. 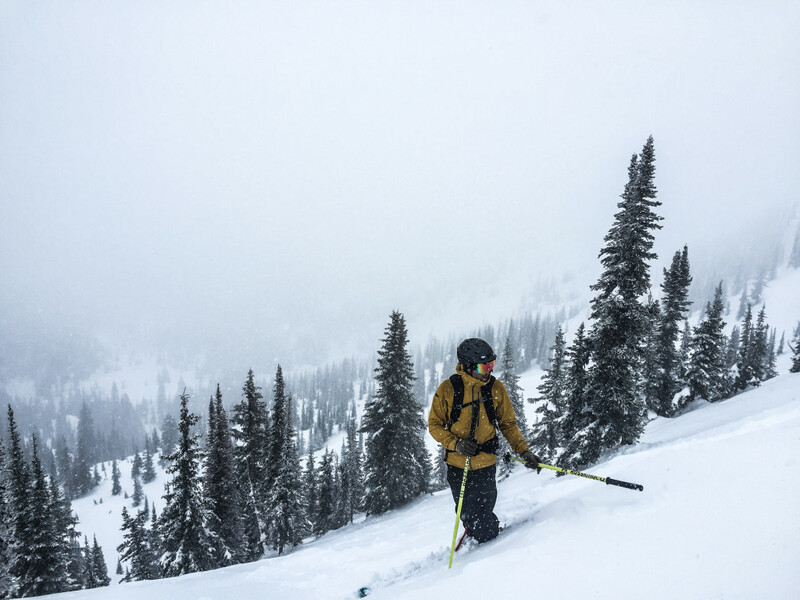 We chose Rossland for its proximity to Washington as well as its access to several resorts and (more importantly) several Cat Skiing operations. What is Cat Skiing you ask? Well, imagine a giant snowmobile with a box on the back that can fit you, two guides, and 10 of your closest friends (or strangers, in our case). These cats can access great skiing far from anyone else, and we had our fingers crossed that conditions would be good. 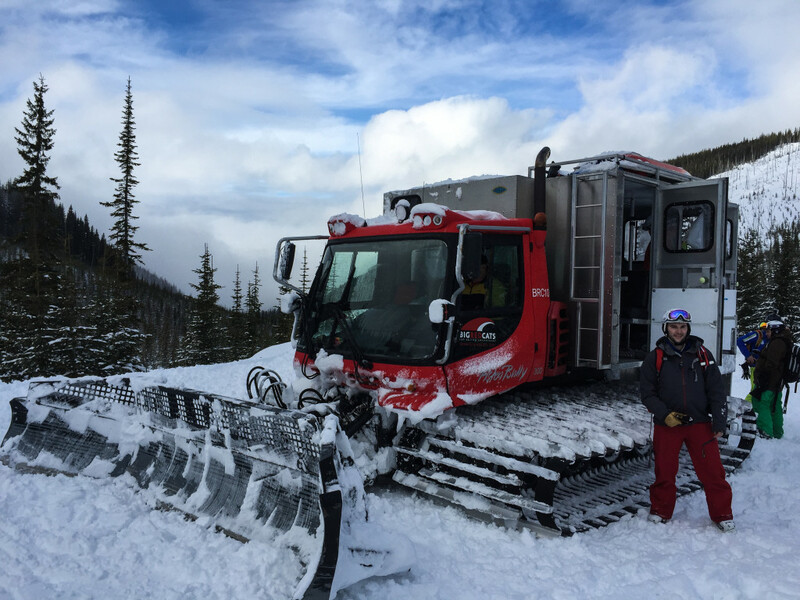 This is the cat – a magic box that takes you into great terrain. We arrived in Rossland on a Saturday and things did not look great. It was warm, raining, and the locals were wandering around the quaint little ski town rather than up at the mountain skiing. Still, we woke up Sunday morning and headed up to Red Mountain Resort for some skiing. Unfortunately conditions were not great. Lets just say Patrick and I usually avoid groomed ski runs, and on Sunday we were seeking them out. Still, there was snow in the forecast so we again went to bed with visions of powder skiing in our heads. Monday morning Patrick and I woke up and headed up to another resort nearby, called Whitewater. We didn’t know much about Whitewater other than the tree skiing was good, but rumor had it that they got some good snow Sunday night. This turned out to be more than true. When we arrived at around 11 AM, we were greeting with no lift lines, lots of new snow, and the best tree skiing I’ve ever experienced. The runs were mostly open glades, with the spaces between the trees filled with nice light powder snow. Patrick in the trees, wondering where everyone else is. 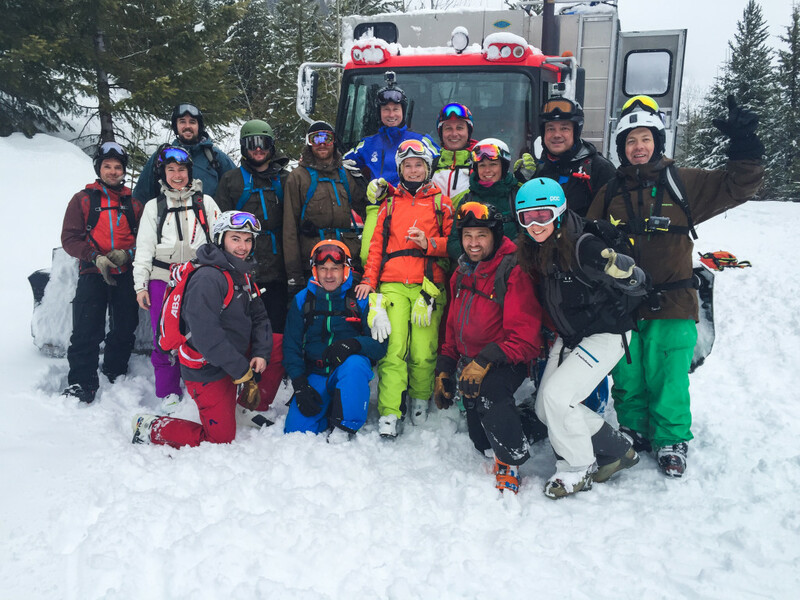 With tired legs and faces sore from smiling, we prepped for our first day of Cat Skiing at Valhalla Powder Cats. 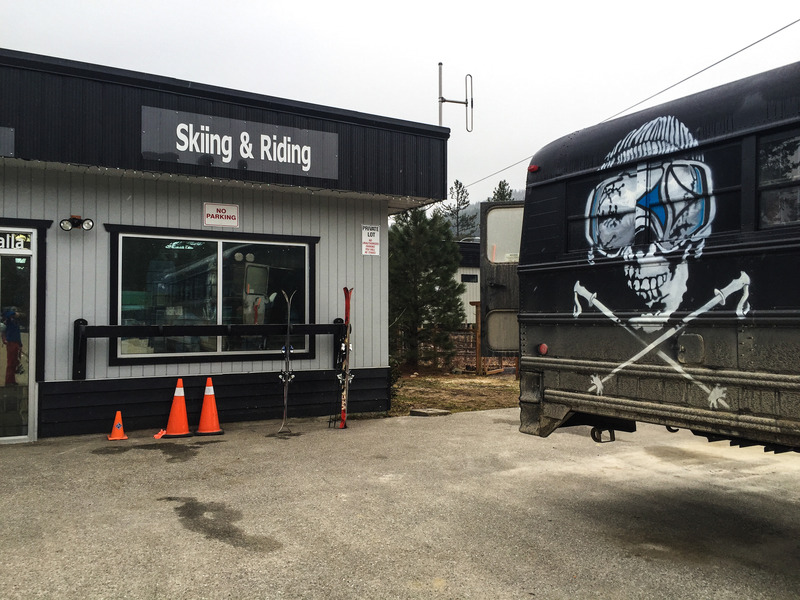 The Valhalla office, complete with ski bum transportation. Having never been Cat Skiing before, I wasn’t quite sure what to expect. I was prepared for a hard day of skiing as I knew it had snowed a lot more overnight and that Valhalla had a reputation for excellent terrain – it seems to be the choice of pro skiers. I was a little intimidated, but luckily we were set for another excellent day of skiing. Our guide, showing us the ropes before we drop in. Our day started with an avalanche briefing and a long bus ride up to Valhalla Pass. Once there, we did some rescue drills and loaded up into the cat for our first run. After a few turns all concerns about being over my head were replaced with the feeling one gets when they are over their head in powder. Turns were deep, terrain was great, and our guide kept us moving and safe all day. Needless to say, it was excellent. 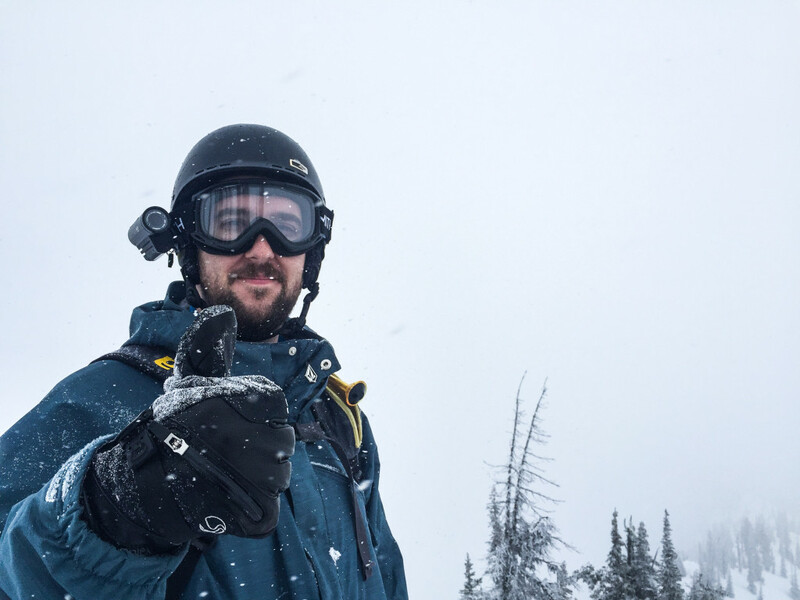 The face of a man who just skied untouched powder and is about to do it again. It snowed hard all day, and everyone in our group was having a blast. 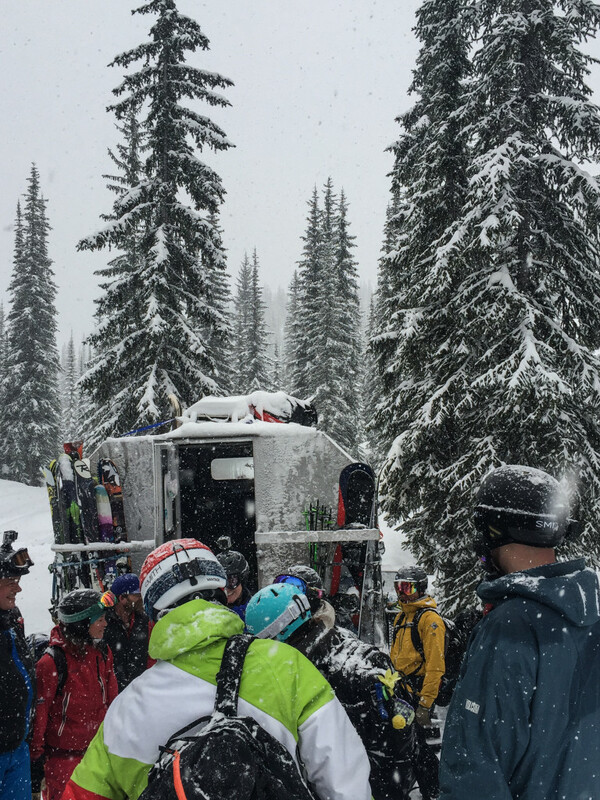 We ended up being paired with a group of German tourists who came to BC specifically for powder skiing. I think they timed it quite well. 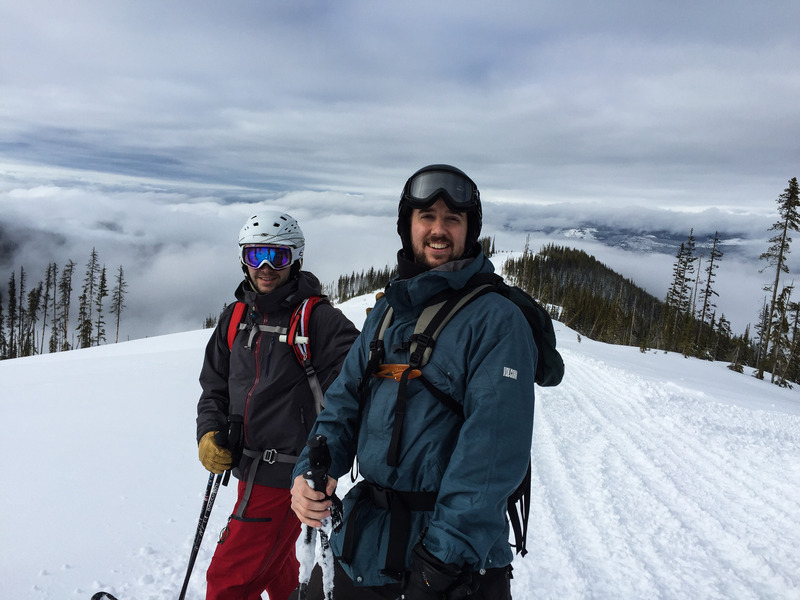 We slowly developed into a rhythm – ski one at a time up top with a buddy keeping an eye on you. Once out of the steep terrain, we would dip into trees together (again, keeping an eye on each other) and find our way down to a road where the cat would be waiting to pick us up and do it all over again. The guides were constantly re-assessing conditions and safety and making changes to the plan along the way. From top to bottom we skiing untouched powder in great steep terrain. Loading up for another run. At the end of the day we had developed a great group and tired legs. Luckily, we had another day of Cat Skiing ahead of us the very next day. Even more luckily, we realized that even though we were going with a different company we would actually spend the day skiing with the German group as well as our guide from Valhalla. Day two – tired legs but big smiles (and the sun even came out). Day two found us at Big Red Cats, a different cat operation with the same group and same guide. 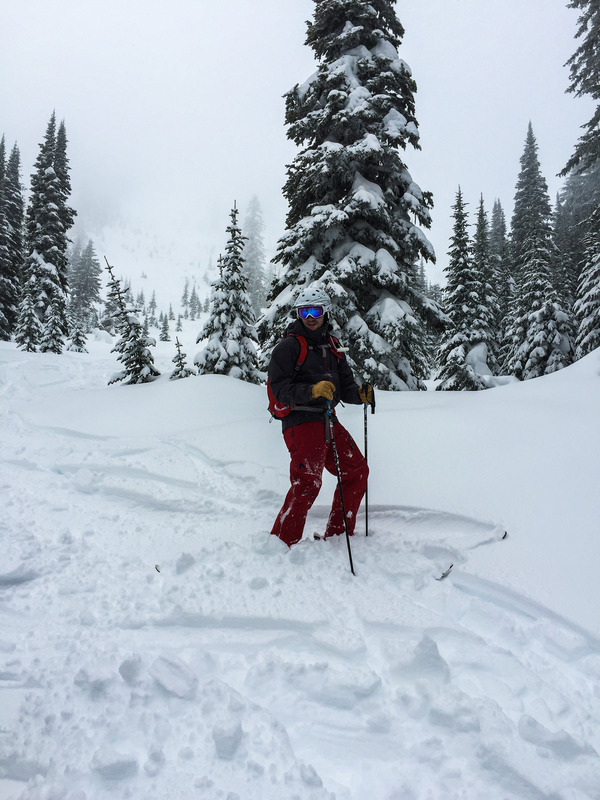 The day progressed mostly the same – meet at the office, load up into a bus, load up a cat, safety briefing, and then of course powder skiing. Resting the legs after skiing powder for 3 days straight. We once again found excellent conditions, great terrain, and a really fun day. The sun even came out for a bit, allowing us to get a sense of what we were skiing and the vastness of the terrain. Its hard to complain when you have a large section of a mountain range to yourself and the snow is soft, but by the end we were definitely feeling our tired legs. Looking up at our tracks coming out of the forest. Unfortunately all good things must come to an end. 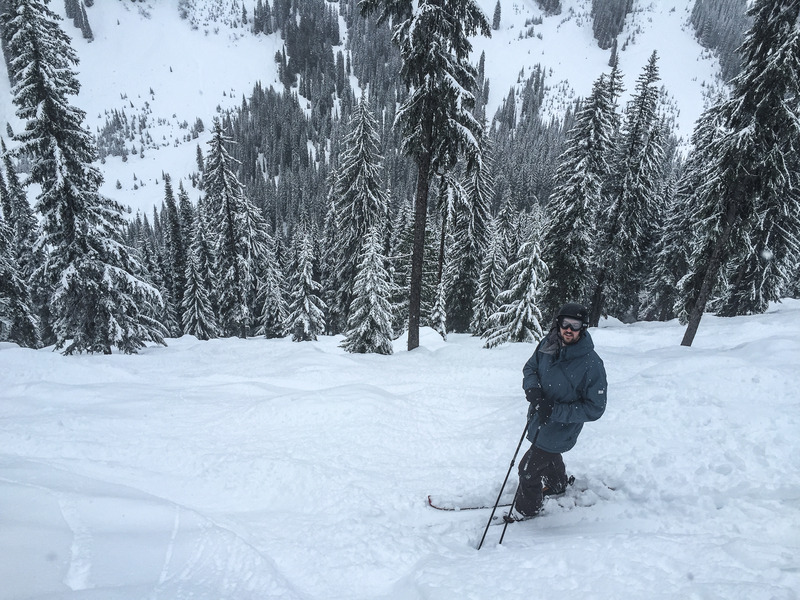 As this was the last Cat Skiing day, I took the next day off to rest up my legs so they could be fresh for Friday’s attempt to ski Red Mountain in better conditions. Our group on day two. Tired and happy. 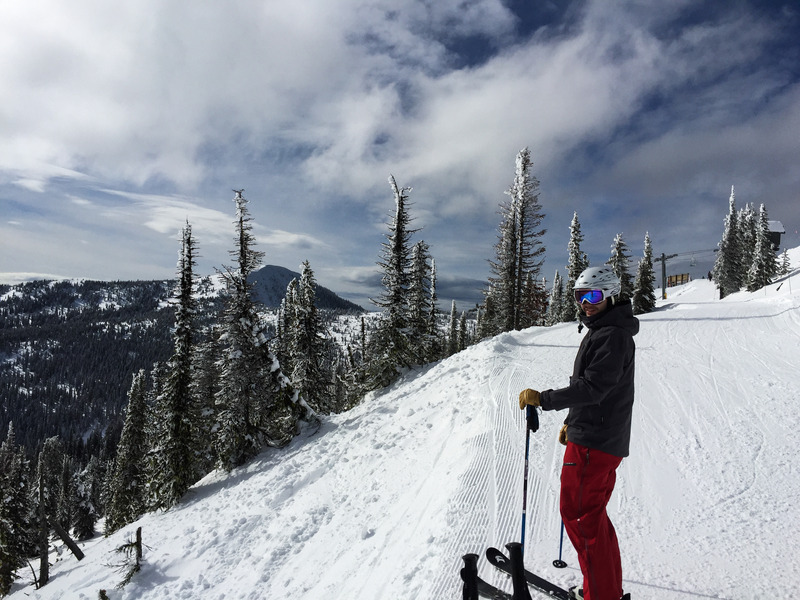 While there wasn’t much new snow Friday, the sun did come out allowing us to ski Red Mountain in Spring-like conditions. It also gave us a chance to glance at their abundant (and steep!) terrain. We scoped out a few named in-bound runs that would put Jackson Hole to shame. Needless to say, I will be back. Enjoying the view at Red Mountain. After a hard week of skiing, the only thing left to do was head to our favorite ski town bar and drink a few beers to celebrate. We packed up the car Saturday morning and hit the road just as the rain came back. Somehow we managed to time this trip just right. Given the terrain, the snow, and the fun we had I can’t help but think we will need to make this trip something of a tradition. 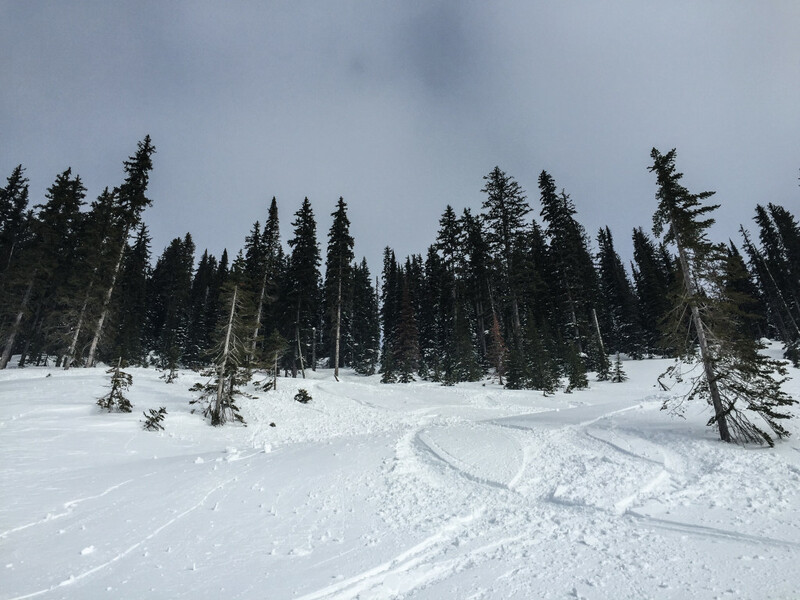 This entry was posted in Alex, Life, Skiing, Travel and tagged rossland, skiing, travel on March 13, 2016 by Alex Allen.